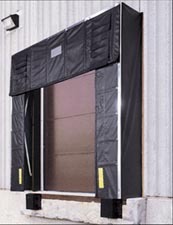 For use with 8"W x 10'H doors. Top (header) is constructed of sloped wolmanized lumber and is built with a slope to allow for water run-off. 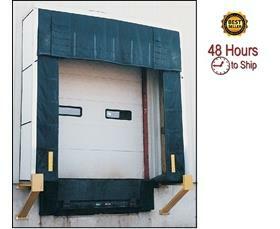 Header measures 114"W with a 30" drop curtain. Side (verticals) measure 120" tall and contain high density foam mounted to treated lumber. Once mounted, the face of the vertical will measure 12"W and will taper to 9.5" at wall. Verticals are mounted on 2" x 12" allowing mounted down the length of vertical pieces. 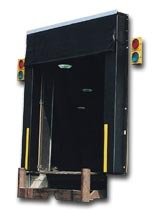 All dock seals and shelters on this page are not returnable. FOB Shipping Point. 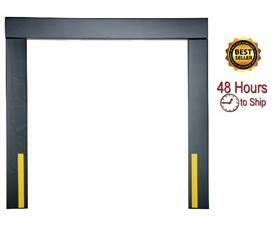 No steel protectors required ­ frame pushes back to eliminate damage if trailers back in off-center. Fits doors 8'W. x 8'H. to 10'W. x 10'H. Projection 24". FOB Shipping Point.